Steam has been used as an effective method of sterilization for centuries. French chemist Louis Pasteur first discovered that bacteria can be killed at 120 degrees Fahrenheit in the mid-19th century. And while he’s better known for inventing pasteurization, with this knowledge he also invented the sterilization method of heating or boiling instruments in order to kill microorganisms. This technique eventually led to the use of autoclaves in hospitals, vet offices, tattoo parlors and other establishments for effective sterilization. But what is expected of autoclave devices over the next few years? Let’s take a closer look at the market for both new and refurbished autoclaves. According to a recent research report, the Steam Autoclaves Market will surpass $3 billion by 2024. It’s expected that the market for veterinary autoclaves, tattoo autoclave sterilizers, and medical autoclaves will continue to increase due to the rise of nosocomial infections and the increasing number of surgical procedures and tattoo parlors. In hospitals and other healthcare settings, the growing need for managing more medical and biohazardous waste will lead to increased manufacturing and purchasing of autoclaves. The uses of autoclaves will lead to increased efficiency when it comes to sterilizing with higher temperatures, penetration power, and efficiency of steam used for sterilization. While healthcare settings will see further needs for autoclaves, laboratory settings will also lead to an increased market as well. Due to the increasing amount of waste produced by healthcare facilities and pharmaceutical companies, the uses of autoclaves will expand to ensure waste management and proper sterilization is optimized. 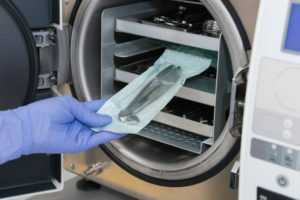 Generally, facilities have large, stationary autoclaves to handle the sterilization of mass amounts of instruments and equipment that is often needed. But there is expected to be an increased demand for portable autoclaves over the next few years. More facilities will be looking for autoclaves that offer a big interior chamber for maximized efficiency, but also autoclaves that can be easily moved as needed. Overall, it’s predicted that more and more facilities and companies will seek the benefits autoclaves can offer when it comes to easy sterilization. Higher-efficiency autoclaves will be expected so companies can maximize how and when they sterilization their instruments. But as you can see, autoclaves continue to serve an important purpose in today’s society. StatimUSA.com is your number 1 resource for all things autoclaves, we sell new autoclaves, repair your old autoclave and even purchase your old autoclave back from you. Try us today, you wont regret it! You can reach us at info@statimusa.com or call our FREE TECHNICAL SUPPORT LINE at 704-966-1650.